There's nothing like a sandwich that hits all the notes on the tongue and this grilled cheese does just that. 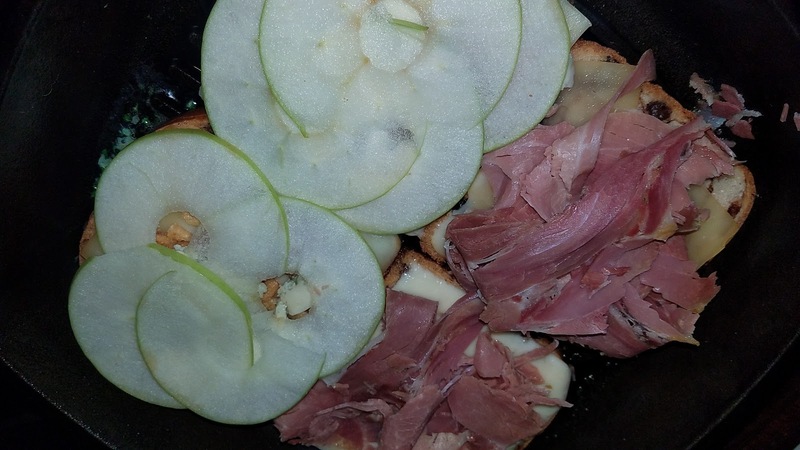 The cheeses are Pepper Jack, Gouda and Apple Smoked Cheddar, two from the Wisconsin family. 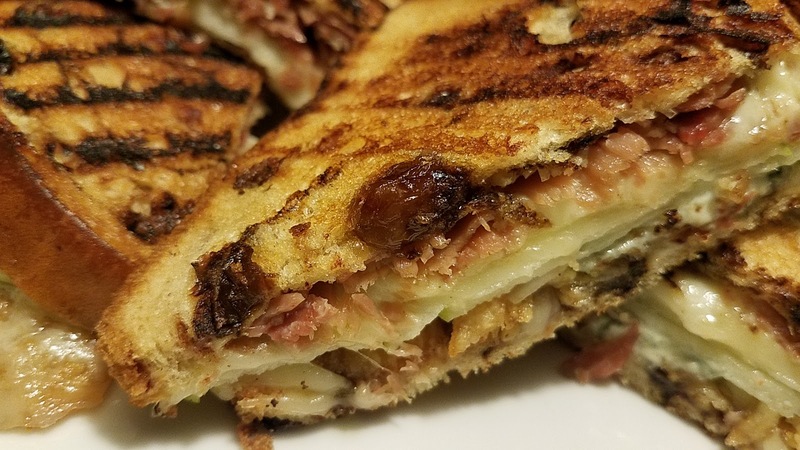 Add in the crunchy component of the thinly sliced Granny Smith apples, french fried onions and the toasty cinnamon raisin bread and you have some serious eats on your hands. Thinly sliced country ham is lovingly referred to by some fellow culinarians as ''Virginia Prosciutto". This is actually my creation for a recipe contest that I failed to get in on time, my computer decided to be a complete @$$ and lost it's connection right at the point of upload and I ran out of time. I accepted my technology fail gracefully and was grateful that I at least had a tasty recipe to share with my peeps, even without the $15,000 prize. I decided to get it next year and plan better for when "stuff" happens. The thin cut of the cinnamon raisin bread requires that you use a lower than normal temperature to toast the bread while simultaneously melting the cheeses. A LID is suggested also. Too high a temperature will cost you the in the form of burnt raisins and bread. I used a grill pan and found that this bread responds well to it, considering it's lack of thickness. Heat the grill pan on medium to medium low. Spray with olive oil diffuser or nonstick spray. Add desired spread to one side of bread and place in pan. 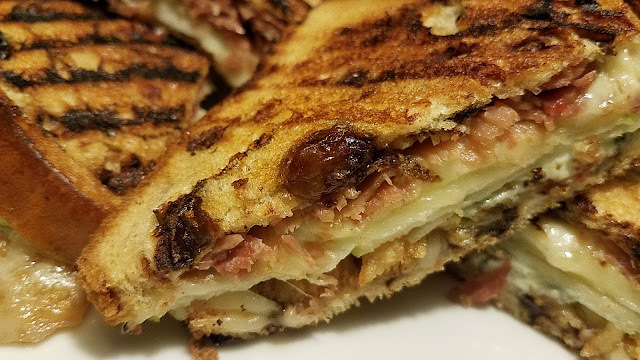 Layer the ingredients starting with smoked Cheddar, fried onions, then apples on one side and Gouda, country ham (sparingly, it's highly seasoned), followed by the Pepper Jack on the other. Cover with lid and and allow the bread to grill slowly as not to burn and melt the cheeses, about 7 minutes. Flip one side onto the other. Cut in half for presentation.